Visit the CS:APP web page http://csapp.cs.cmu.edu for more information and access to all student and instructor resources. 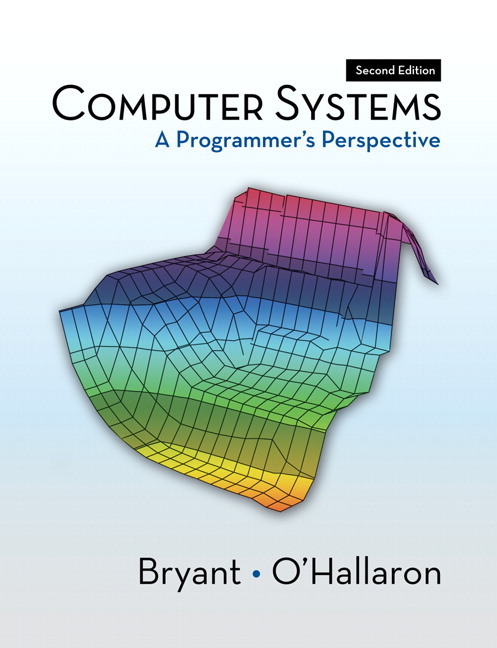 Also check out the new CS:APP blog for interesting stories, updates on the book contents and extra material, and the authors' experiences in using this book in courses at CMU: http://csappbook.blogspot.com. Web asides, parenthetical remarks that supplement the main presentation of the book, are referenced within the book, and are available from the CS:APP web page. Chapter 2: Representing and Manipulating Information. The authors added more careful explanations of concepts and many more practice and homework problems to make the material more accessible. Some of the more theoretical aspects are moved to web asides. A description of some of the security vulnerabilities that arise due to the overflow properties of computer arithmetic is included. Chapter 3: Machine-Level Representation of Programs. Coverage is extended to include x86-64, the extension of x86 processors to a 64-bit word size. Code is used that is generated by a more recent version of gcc. Coverage of buffer overflow vulnerabilities is enhanced. Web asides are included on two different classes of instructions for floating point, and also a view of the more exotic transformations made when compilers attempt higher degrees of optimization. Chapter 4: Processor Architecture. A more careful exposition of exception detection and handling in processor design. A new web aside showing a mapping of the processor designs into Verilog, enabling synthesis into working hardware. Chapter 5: Optimizing Program Performance. Greatly enhanced coverage of how an out-of-order processor operates and a new, simple technique for analyzing program performance based on the paths in a data-flow graph representation of a program. A web aside describes how C programmers can write programs that make use of the SIMD (single-instruction, multiple-data) instructions found in more recent versions of x86 processors. Chapter 6: The Memory Hierarchy. Added material in solid-state disks, and an updated presentation based on the memory hierarchy of an Intel Core i7 processor. Chapter 8: Exceptional Control Flow. An enhanced discussion of how the process model introduces some fundamental concepts of concurrency, such as nondeterminism. Chapter 9: Virtual Memory. The memory system case study is updated to describe the 64-bit Intel Core i7 processor. The sample implementation of malloc is updated to work for both 32 and 64-bit execution. Chapter 12: Concurrent Programming. Increased coverage of the general principles of concurrency, and a description of how programmers can use thread-level parallelism to make programs run faster on multi-core machines. The old Chapter 9 (Measuring Program Execution Time), has been deleted. In addition, a number of practice and homework problems have been added or revised. David R. O'Hallaron received the Ph.D. degree in computer science from the University of Virginia in 1986. After a stint at General Electric, he joined the Carnegie Mellon faculty in 1989 as a Systems Scientist. He is currently an Associate Professor in the Departments of Computer Science and Electrical and Computer Engineering. He has taught computer systems courses at the undergraduate and graduate levels, on such topics as computer architecture, introductory computer systems, parallel processor design, and Internet services. 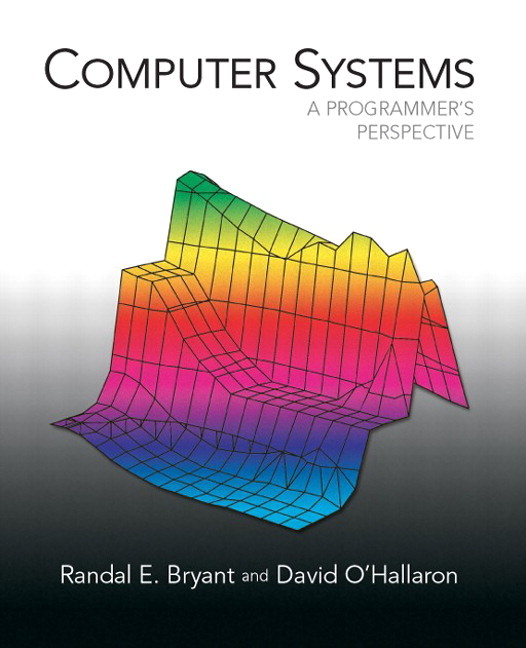 Together with Prof. Bryant, he developed the course "Introduction to Computer Systems" that is the basis for this book. Prof. O'Hallaron and his students perform research in the area of computer -systems. In particular, they develop software systems to help scientists and engineers simulate nature on computers. The best known example of their work is the Quake project, a group of computer scientists, civil engineers, and seismologists who have developed the ability to predict the motion of the ground during strong earthquakes, including major quakes in Southern California, Kobe, Japan, Mexico, and New Zealand. Along with the other members of the Quake Project, he received the Allen Newell Medal for Research Excellence from the CMU School of Computer Science. A benchmark he developed for the Quake project, 183.equake, was selected by SPEC for inclusion in the influential SPEC CPU and OMP (Open MP) benchmark suites.